The Great Lakes region was blessed with abundant freshwater for its rivers and lakes. Water as a resource and method of transportation were an important factor in Akron, OH, blossoming as one of America’s early manufacturing hubs during the late 1800s and early 1900s. But it was this industrial past that led to the pollution that brought the U.S. EPA to issue a federal mandate for the City of Akron to comply with the Clean Water Act of 1972 to end pollution in local waterways. Because about a quarter of Akron’s existing sewer system had been designed as combined sewers when constructed in the early 1900s, frequent overflows mixed stormwater with sanitary sewage. This mix ultimately emptied into the Cuyahoga River, the Little Cuyahoga River, the Ohio and Erie Canal, and Lake Erie. 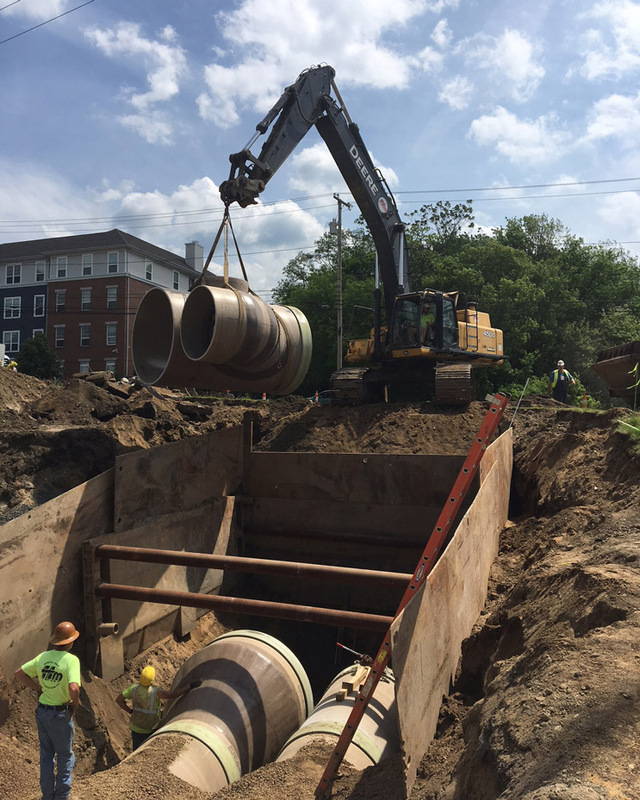 As part of the solution, The City of Akron created a program termed “Akron Waterways Renewed!” to control combined sewer overflow (CSO) and improve water quality in nearby rivers. A portion of that plan was to create a 6,240-foot Ohio Canal Interceptor Tunnel (OCIT); three new storage basins; upgrade CSO racks, and upsize and reinforce the main outfall sewer cap. The 27-foot diameter OCIT sections were a feat in themselves, dug with a massive tunnel boring machine, and constructed of reinforced concrete (RCP). The basins will hold combined sanitary and stormwater overflow until it can be safely released to Akron’s wastewater treatment facility. It is the largest of the three new storage basins. HM Miller Construction was subcontracted for the site work for the Howard Storage Basin (CSO Rack 22), one of Akron’s 34 sewer separation units, as well as relocating the existing waterline to accommodate influent piping. The HM Miller engineering staff saw a potential problem with the original design that called for elliptical RCP influent line to run beneath Cuyahoga Street. They realized that there would be difficulty in achieving clearance under the public road, even though the RCP line would be elliptical, and that could lead to inability of the RCP line to pass the required pressure test specification, according to John Smith, president of HM Miller Construction. Smith called upon his resources at Hobas to assist in devising an alternate plan for CSO 22 that would resolve the inherent difficulties surrounding installation and testing using the RCP. Together they came up with a design that saved time and money tying the Howard Storage Basin into the main line. In place of the elliptical RCP originally specified to be installed under Cayahoga Street, the new design called for twin 57” Hobas CCFRPM pipe that would tie into the OCIT-1 main line with a concrete collar subsequently designed by the project engineer. 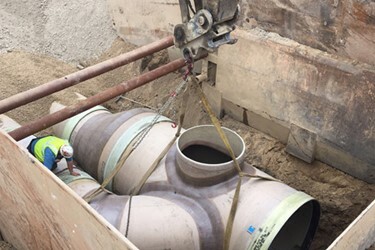 A large wye is lowered for connection to the already installed CCFRPM pipe. The lightweight pipe requires less equipment and is easy to maneuver on the job sites. 10 fittings that included various elbows, wyes, and reducers. A two-miter elbow is installed with closure couplings. 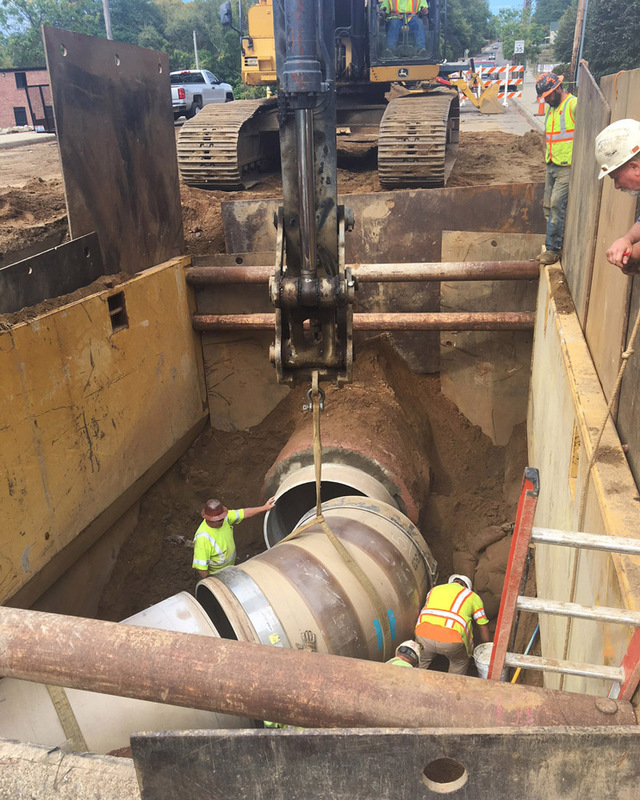 HM Miller Construction, a civil and utilities construction contractor, had a long, 40-year history of contracts with the City of Akron, and had installed over 11,540 feet of Hobas centrifugally cast fiberglass reinforced polymer mortar (CCFRPM) pipe in the Akron area just since 2011. It was respect developed over this long history between the firm, the Public Service Department, and local engineering firms that encouraged the consideration and acceptance of this major design change during the construction phase, long after the engineering design had been completed. In a true instance of teamwork, the owner (City of Akron), design engineer (DLZ/ McMillen &Jacobs/ Jenny), and Construction Manager at Risk (Great Lakes Construction Co.) accepted the alternate plan submitted by the subcontractor.